In the singular search for profits, some corporations inadvertently kill humans. If this routinely occurs throughout an industry, it may no longer serve a net positive social purpose for society and should be eliminated. 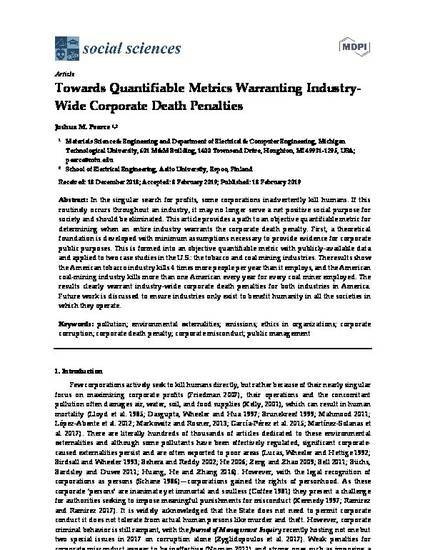 This article provides a path to an objective quantifiable metric for determining when an entire industry warrants the corporate death penalty. First, a theoretical foundation is developed with minimum assumptions necessary to provide evidence for corporate public purposes. This is formed into an objective quantifiable metric with publicly-available data and applied to two case studies in the U.S.: the tobacco and coal mining industries. The results show the American tobacco industry kills 4 times more people per year than it employs, and the American coal-mining industry kills more than one American every year for every coal miner employed. The results clearly warrant industry-wide corporate death penalties for both industries in America. Future work is discussed to ensure industries only exist to benefit humanity in all the societies in which they operate.